Product Information . 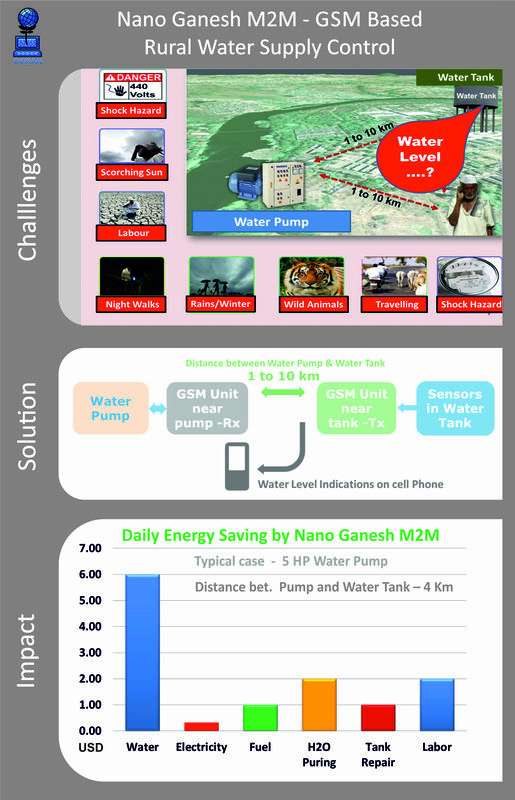 . .
Nano Ganesh is a GSM Mobile based remote control system exclusively for the use with water pump sets in agriculture areas. The need of Nano Ganesh arised from the routine problems faced by the farmers in operating the pumps. They are, fluctuations in power supply, difficult terrain, fear of animals on the way to pumps, hazardous locations of the pumps along the river or water storage beds, shock hazards, rains etc. A farmer can control the pumps from any distance. He can check an availability of power supply at the pump end. He can acknowledge the on / off status of the water pump. A Nano Ganesh Instument is connected to the existing starter. A farmer has to simply dial a number dedicated for a Nano Ganesh set and then punch his on or off code for the control of the pump set. It can be connected to any existing electrical starter and motor pumps. Hence, there is no necessity of replacing the pumping set. For higher H.P pumps, it can be connected along with the protection systems. Water pump can be controlled from any distance by a mobile or land line phone. A mobile network is essential near the water pumps. One can check availability of the power supply at the pump end. One can check the load on / off status by a simple audio tone. Automatic Mode / Remote Mode Available. Provision of memory for storing the on and off commands. Output : 5 Amp. potential free relay contact. Input : [ 1 ] To receive a command of on / off from the mobile phones. Weight : approx. 700 gms.